If you are not following @Queen_UK on twitter – how can you look at yourself in the mirror? The insanely awesome behind-the-crown look of what is happening around Buck Palace and Sandingham is epic. Who knew they held Strictly Come Dancing fancy dress parties where Princess Anne came as Bruce Forsyth and Camilla as Tess Daly? 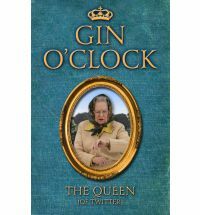 Welcome to the WONDERFUL world of “Gin O’Clock“! Mr Cameron on the phone. Says cost of the olympics could exceed budget. Although Mr Clegg has donated use of his trampoline, so that helps. If anyone sees the Duchess of Cornwall, do give one a call. She may be wearing a Father Christmas outfit and smoking an enormous cigar. Now, some clever sausage has contacted The Queen, and have been able to obtain her diary for the past year, which is now avaliable in a cleverly contained item called a book. With this unpresented access, we can find out what The Queen truly feels about the time-share [like a villa in the Algarve] Prime Minister David Cameron, Nick Clegg, and all the other numpties that “grace” her path. Angela Merkel on the phone. Bit upset. Apparently the Euro is now worth less than those little chocolate coins one puts on Christmas trees.